"Running into a long-ago friend sets memory from the 1970s in motion for August, transporting her to a time and a place where friendship was everything--until it wasn't. For August and her girls, sharing confidences as they ambled through neighborhood streets, Brooklyn was a place where they believed that they were beautiful, talented, brilliant--a part of a future that belonged to them. But beneath the hopeful veneer, there was another Brooklyn, a dangerous place where grown men reached for innocent girls in dark hallways, where ghosts haunted the night, where mothers disappeared"--Amazon.com. How does she do it? In less than 200 pages, Jacqueline Wilson has painted an evocative portrait of a young woman coming of age in Bushwick in the 1970s. The setting, the people, and the emotions were all so vivid; I felt transported back to that place and time. At the center of the novel is August, born in Tennessee and now living with her father and brother in Brooklyn. Somehow, my brother and I grew up motherless yet halfway whole. My brother had the faith my father brought him to, and for a long time, I had Sylvia, Angela, and Gigi, the four of us sharing the weight of growing up "Girl" in Brooklyn, as though it was a bag of stones we passed among ourselves saying, "Here. Help me carry this." Jacqueline Woodson's latest novel, which was chosen as a finalist for this year's National Book Award for Fiction, is narrated by August, an African American woman of 35 who returns to Brooklyn after the death of her father. She revisits her teenage years in the mid 1970s spent there in the company of her father, younger brother, and especially the three girlfriends who meant as much to her as anyone else during that time. Each girl had a unique background, and brought a different aspect to their shared relationship: August came from rural Tennessee, Gigi from South Carolina, and Sylvia from Martinique, with Angela, the most streetwise of the four, being the only one who was born in Brooklyn. Their families were also quite different, although each one struggled to survive in the increasingly dangerous streets of that troubled borough, which were plagued by heroin addicts, prostitutes, and gangs, as white residents fled their neighborhoods and rented their homes to anyone who could pay a deposit and one month's rent. The girls' experiences match the changes and increasing danger in their neighborhood, as their developing bodies and sexuality put them at greater risk by predatory boys and men who wish to claim their innocence and derail their promising futures. The novel consists of short paragraphs, narrated in the first person by August, with evocative descriptions of the city and the music of the time that somewhat reminded me of my own considerably less troubled childhood living in nearby Jersey City in the early 1970s, particularly when August mentions her Close 'N Play record player, which I received as a birthday present in 1969. Jacqueline Woodson is best known for her memoir in verse, Brown Girl Dreaming, which won the 2014 National Book Award, the Coretta Scott King Award, a Newbery Honor Award, an NAACP Image Award, and the Sibert Honor Award. Her latest book, Another Brooklyn, isn’t in verse but it somehow reads like it is. In other words it is lyrical and it is stunning. Running into an old friend on a train triggers memories, both good and bad, for August, who is in Brooklyn to bury her father. And they navigate their world of growing up as girls, trying to find their place in this world, in 1970s Brooklyn, with absent mothers, drugs, uncertainty, and changing times. Another Brooklyn is a collection of memories and a wonderful freeflow of vignettes past and present. The death of her father brings thirtysomething August, an anthropologist, back home to Brooklyn physically, and the contact with her younger brother and an estranged girlhood friend bring her back emotionally in this short novel-in-vignettes exploration of that girlhood. I thought the story was going to be about four adolescent girlfriends, but I found it more about one specific girl’s coming-of-age within a broken family in 1970s impoverished Brooklyn. I loved Woodson’s Brown Girl Dreaming and this is the second book I’ve read by her. It seems suited to YA or adult readers -- the coming-of-age is more mature than in Brown Girl Dreaming, the story and style more opaque, the tone more melancholy than optimistic. While neither book portrays a childhood full of happiness, both develop a wonderful feeling of family care and safety. I so look forward to more by Woodson. A coming of age story set in Brooklyn in the 1970s. August moves to Brooklyn with her father and her brother. She misses her mother and is uncertain how to make her way in a new place. But she makes friends of the sort who create both the fore and ground of her life. This is their story as much as hers. When this very short book begins, August, an anthropologist, has attended the funeral of her father in Brooklyn, a place she had not returned to in a couple of decades. While riding the train to her father’s home to go through his things, she explores her memories, sparked by the sighting of one of her old friends who is sitting in the same subway car. The reader is given a window into the world of the ghetto in Brooklyn, with all of its hidden and overt dangers in the 1970’s. As a child, in the middle of the night, she and her brother were spirited away from their idyllic, lakeside life in Tennesee, all the way to Brooklyn, New York, by their father. Their mother had become unstable since the death of her brother in Vietnam. She believed he was still alive and she had conversations with him in which he issued warnings to her and advised her about the imagined sins of her husband. She went to bed with a knife beside her. When they arrived in Brooklyn, the children, 8 and 4, had to make a big adjustment to their lifestyle. Often forbidden from leaving the house, they simply stared at life outside, from their window. Previously, they had been able to run freely on their Tennessee property. August kept reassuring her younger brother that their mother woulg return, and for years, she refused to accept the fact that she would not be coming back. August makes several good friends, and they share their ideas and dreams as they grow up and enter puberty complete with the developing body and desires of women. How they fare in their lives is an interesting part of this story. The neighborhood they lived in is poor, but they were not desperate. They saw others who were far worse off. They, at least, had food and clothing and shelter. They could enjoy an ice cream. Their world is very different than their world had been in Tennessee, but they were adjusting. August’s father found religion as did her brother. They followed The Nation of Islam. When as a teenager, August retreated and stopped communicating, her father arranged for her to see a fellow, female member of The Nation. There was also a woman who helped in the house who wore traditional garb. August is told that her body is a temple that she should protect. She was also taught about what was considered a proper diet to follow. Some foods were forbidden. With a spare prose, Woodson quietly describes this child’s growth and view of the world in the 1970’s as the whites exited their neighborhoods when people of color moved in, as ghettos formed and wars were fought which took many of their neighbor’s lives and limbs. Returning soldiers and single mothers descended into a world of poverty, drugs and prostitution. Danger lurked in unsuspected places. The story reveals the dreams of August and her friends, talented and bright, but who did not always realize that there were consequences for the choices that they made. I grew up in Brooklyn, although I left about a decade before the time of the book. When August reviewed her memories of Coney Island and when song names were mentioned and the Blackout of most of New York City was described, I grew nostalgic and my memory was also reawakened. I remembered the boardwalk, and the music. However, I remember the major blackout of 1965, more fully, in which the entire Northeast went dark, not just a large part of New York City, which took place in 1977 and must be the one August details. I loved this beautifully written story of four pre-teen girls, August, Sylvia, Angela and Gigi coming of age in the mid '70's. The story is told from the vantage point of August. When her mother has mental health issues, August and her brother are uprooted from their Tennessee farm by their father and move to Brooklyn, New York. Brooklyn is not an easy place to grow up. Drugs, murder and prostitution affect the girls on a daily basis. Their home lives are not at all ideal and even their friendship suffers from betrayal. The story follows them to adulthood and reveals the path that each as taken. I especially liked the references made to songs of the 70's, Rock the Boat, Minnie Riperton and Al Green, they all added to the authenticity of the era. "We opened our mouths and let the stories that had burned nearly to ash in our bellies finally live outside of us." 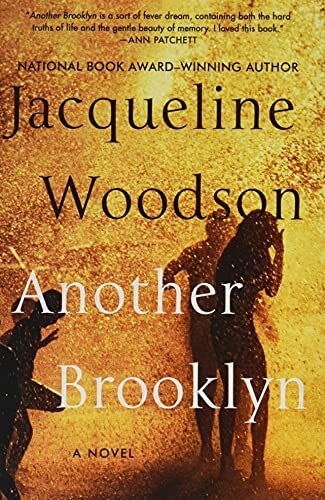 In Another Brooklyn, YA author and poet Jackie Woodson has written a novel of memories, a narrative with poetic sensibilities, a story of fighting to belong to a brother, a group of three other girls, a father, and a mother who lost her grip on the world when her own brother died fighting in Vietnam. We learn early on that the grown narrator still loves her brother, even though they live separate lives, separate realities. Riding the subway, August sees one of those three girls who were once as close as sisters to her. She strides off the subway a stop early, even though that once close-girl, recognizable even in her womanhood, starts to greet August. "Where would we be now if we had known there was a melody to our madness?" This is the story of what happened to the girls. They cope with becoming young women even as they navigate a Brooklyn filled with heroin-addled Vietnam vets, dirty old men who would pay a quarter to look up their dresses and a prostitute with two young children who lives in the apartment below that shared by August, her brother and father. "For God so loved the world, their father would say, he gave his only begotten son. But what about the daughters, I wondered. What did God do with his daughters?" The girls each have dreams, although not every one will see hers come true. And here are boys, boys who want to be men, boys who are enchanted by them, boys who make them want to sing and dance and perhaps become women. August and her brother, when they first move to Brooklyn from a failing Tennessee farm, watch the other three girls saunter down the street like they own the world. When school starts, she is adopted by the group. "What did you see in me? I'd ask years later. Who did you see standing there? You looked lost, Gigi whispered. Lost and beautiful. And hungry, Angela added. You looked so hungry." As they grow and change, as their families let them down or build them up, the girls store memories of what they are living. Those memories, and the clouded ones August brought to Brooklyn with her, that eventually clear as she grows, form the core of this book. "Everywhere we looked, we saw the people trying to dream themselves out. As though there was someplace other than this place. As though there was another Brooklyn." This moving, lyrical novel tells the story of August, who moved to Brooklyn from Tennessee in 1973 at age 8 with her 4-year-old brother and their father. Woodson employs dream-like free verse to conjure up an era punctuated by conflicts in class, race, and gender, PTSD from the Vietnam War, depression, suicide, and black empowerment. Yet at no time does one get the impression that the author is packing her book with “issues” to be relevant. Rather, it seems like a strikingly real portrait, albeit filtered through the gauzy veil of poetic language. The beauty of the words softens the harshness of their meaning, and the brevity of the stanzas lends a snapshot effect to the prose. It is as if we are looking at a picture album of times gone by. In the story, August, now in her thirties, has returned to Brooklyn for her father’s funeral, and is thinking back on her coming of age in Brooklyn, when she made a group of close friends and confronted the truths about her life and theirs she had been reluctant to face. "It seemed wherever we were, there were hands and tongues. There were sloe-eyes and licked lips. Wherever our new breasts and lengthening thighs moved." The changes in the girls unfolded against a backdrop of changes in Brooklyn, with more and more white people leaving, and mistrust between the races increasing. How well Woodson captures the general mood of the times, recalling that “[t]hat year, every song was telling some part of our story.” This was of course a sentiment shared by all the races, one that still persists and helps makes each generation so attached to the music of its own time. And it suggests one of the themes running through the story: "At some point, all of this, everything and everyone, became memory." A lyrical short novel, about a young teenage girl coming of age after moving with her father & brother from Tennessee to Brooklyn, NY. This novel follows August after her father moves she and her brother from rural Tennessee to Brooklyn, where he grew up. Unused to the city, they stare down from their windows. Later, she makes 3 great friends, and they spend their tween and young teen years as 4 inseperable black girls. Despite their different backgrounds (parental status, origin, attention at home) and their different dreams, they stick together. Brown girl dreaming was the first book I read of Woodsons, also the first book I read in the poetry, prose style of writing in which that book was written. I found that book incredibly touching and though this book is written in a narrative, I found this one equally touching. This author has a way of expression that is recognizably hers, her words flow, almost like music on a page, beautiful music. Another young girl, named August, but this time she leaves the South with her father and younger brother. They come. to Brooklyn, live in an apartment building where they struggle to adjust without their mother. For the longest time we are only treated to glimpses of exactly what happened to her. August, will be greatly aided by the friendship of three other girls. Together they will weather the pre teen years, the storm that is the teenage years and each will experience losses that will irrevocably change them in different ways. Young friendships, hopes and dreams, drugs, white flight, the Muslim religion, sexuality and its consequences are all explored in this short novel. August is a wonderful narrator, her joy, pain and anguish shine through her thoughts and words as she fights to understand the world she inhabits as a young black youth. Stirring, and wonderfully written, this is another unforgettable story written by this amazing author. Really, really beautifully written. I admit that I did not follow the plot super-closely, I just appreciated the evocative vignettes that make up the book. Well worth your time. A coming-of-age story set in 1970s Brooklyn, pieced together from memories that read like poetry. With short, lyrical prose Jacqueline Woodson captures the essence of August's formative years: the longing of days spent staring out the window, the intimacy of her group of female friends, relentless male violence in public and private, dreams of the future, dalliances with the Nation, deaths of mothers and friends. "We had blades inside our kneesocks and were growing our nails long. We were learning to walk the Brooklyn streets as though we had always belonged to them—our voices loud, our laughter even louder. August, an Ivy League-educated anthropologist, reminisces about her coming-of-age years in Brooklyn in the 1970s. She, her father, and her brother had left Tennessee and moved to New York. There, she met her girls: Gigi, Angela, and Sylvia – and their friendship was everything – until it wasn't. Inseparable, they ambled their Brooklyn streets, believing they were talented, beautiful, brilliant – that the future belonged to them. But just beneath the surface, Brooklyn was another city, too: of drugs, prostitution, gangs, and violence -- , a dangerous place where grown men reached for innocent girls in dark hallways, where ghosts haunted the night, where mothers disappeared. A world where madness was just a sunset away and fathers found hope in religion. When August returns to Brooklyn to be with her father in his last days, the memory of growing up there is presented in beautiful glimpses of how three girls depended on each other to survive. "Somehow, my brother and I grew up motherless yet halfway whole. My brother had the faith my father brought him to, and for a long time, I had Sylvia, Angela, and Gigi, the four of us sharing the weight of growing up Girl in Brooklyn, as though it was a bag of stones we passed among ourselves saying, Here. Help me carry this." Their bonds were necessary but tenuous; each girl's story both fascinating and tragic. "On a different planet, we could have been Lois Lane or Tarzan’s Jane or Mary Tyler Moore or Marlo Thomas. We could have thrown our hats up, twirled and smiled. We could have made it after all. We watched the shows. We knew the songs. We sang along when Mary was big-eyed and awed by Minneapolis. We dreamed with Marlo of someday hitting the big time. We took off with the Flying Nun. But we were young. And we were on earth, heading home to Brooklyn." "A writer writes to hold on. I wanted the Bushwick of my childhood remembered on the page—so I created four girls who were fascinating and foreign to me, stepping far outside of my own childhood. Then I sat them down in a neighborhood that was once as familiar to me as air." Jacqueline Woodson is a brilliant writer. This is a story that explores the bonds and heartbreak of family; the love, limits and pain of friendship; and how a girl grows into womanhood. This is a short but beautifully written novel about a pre-teen girl and her younger brother growing up in the 1970's in Brooklyn, after leaving their mentally ill mother behind in Tennessee. As a newcomer to the inner city, August and her brother are overwhelmed by their new life and surroundings. With their father as their sole provider, they are frequently left alone at home and yearn to play with the kids out in the street. They also desperately miss their mother and long for the day she comes to meet them in Brooklyn. As August acclimates at school and is accepted into a clique of other girls, she gradually comes to see how each girls' situation is similar and different from her family's life. The story moves between the past, present, and future, recalling the experience of growing up motherless but also loved in a neighborhood where people move in and out on a daily basis. Loved the language and the way she told the story. Read it in one sitting.